This figural armillary, constructed of brass and aluminum with a copper numeric banding, hails from Sweden and dates to around 1970. We have repainted it in matte black and mounted it on a well-proportioned carved stone baluster that was removed from the roof of the Coates Thread headquarters in Paisley, Scotland, constructed in 1820. The two are a handsome pairing and will grace your garden year-round, surrounded in summer with waves of lavender and in winter, with snow drifts. This armillary will tell the time, but is set for a more northern latitude. 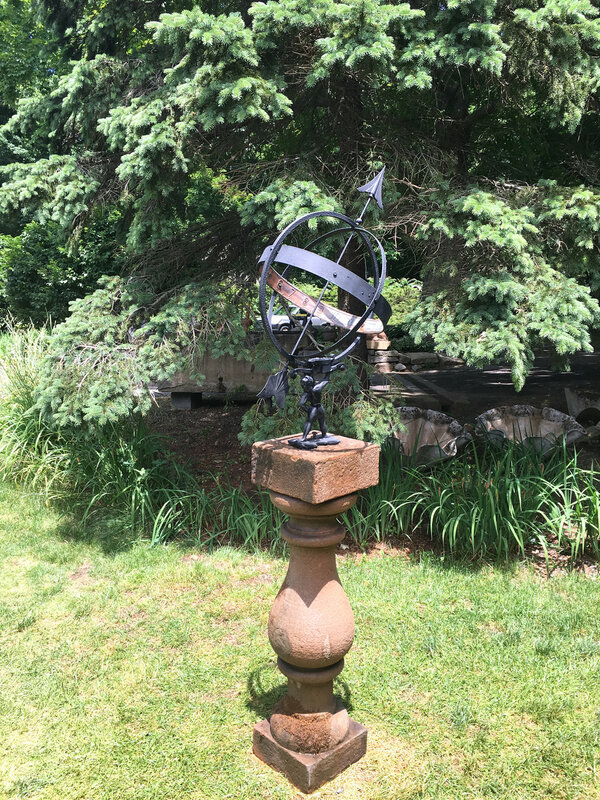 In excellent overall condition, the armillary is perfect, with just a hint of earlier green paint showing through and the stone baluster has age-appropriate surface with remnants of moss and a bit of lichen. Sweden, CA 1970 and Scotland, CA 1820.